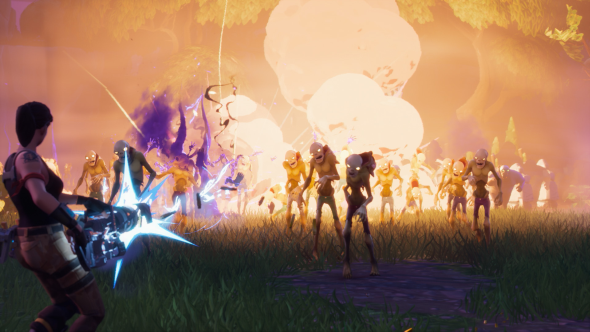 The height of zombie popularity may be behind us, but Fortnite, the upcoming game from Epic Games, is more survival-focused zombie-killing action. To celebrate its release later this month, Epic Games have produced an animated short and, honestly, it’s pretty awesome. For more co-op shenanigans, use our list of the best co-op games on PC. You can watch the short, called ‘A Hard Day’s Night’, above. It’s legitimately funny, I swear. There’s a one liner at the end that’s really, really good. Or maybe I’m just a sucker for one liners. Or both! Fortnite is coming out as a paid early access title July 25, but if you pre-order you can get it on July 21. That’s not Steam Early Access though – Fortnite is going to be available through Epic’s own launcher instead. You can check out the four different versions available for pre-order right here. If you can’t remember what Fortnite is, that’s because it’s taken many years to get finished. For more on that, we’ve got a whole primer on the history of this game.